Conwy Beekeepers’ stall will be in the Farming for Food marquee in the town centre car park (Vicarage Gardens). We’ll be in with the farm animals. Why not call in and see us? Welcome from 7.20pm with tea/coffee and cakes. Meeting starts at 7.40pm. Are you pleased with your bees? Plenty of honey this summer? If not, this talk is for you! You could learn how to set up a small bee breeding group with your neighbouring beekeepers, learning from each other and soon making improvements to your bees. South Clwyd’s breeding group now has some 20 members, who are developing and sharing their skills and their bees. We could do the same. 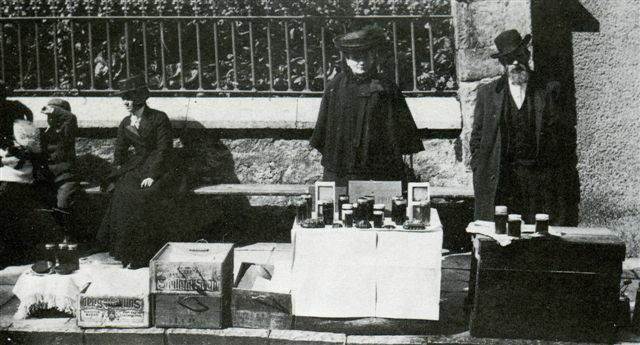 This picture shows Conwy Honey Fair c1900, with Mrs. John Berry’s honey stall.